A requirement is a capability or condition that must be met to ensure that a solution meets the needs of its stakeholders. There is often robust debate about exactly what constitutes a requirement and some proponents will include notions such as Business Drivers and Policies and Business Rules while others will have a much more restrictive view of the requirements. Also a number of requirement methods are Use Case centric and only articulate requirements at a business level while others augment the use cases with detailed functional requirements required by the developers. The highly iterative methods such as Agile typically use User Stories and Requirements together but defer the elaboration of requirements until an iteration (sprint) is being planned. 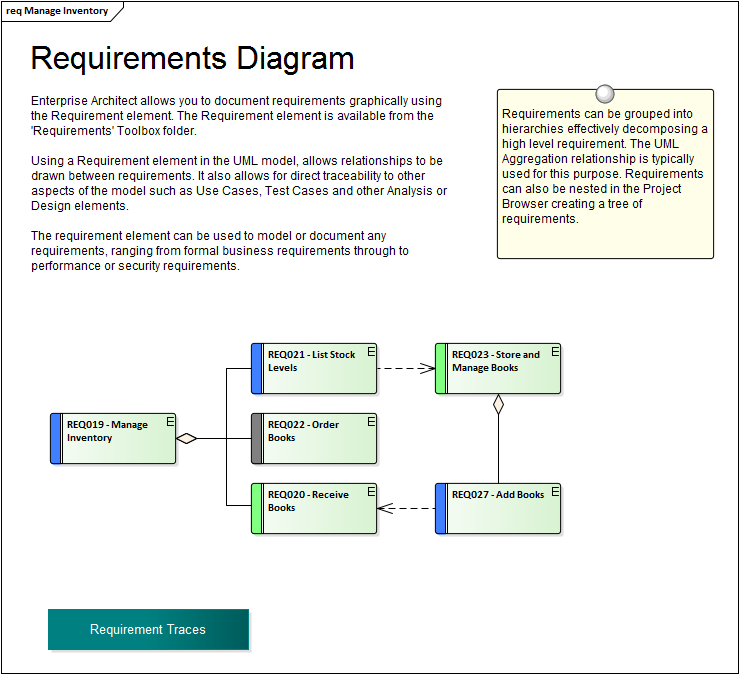 Enterprise Architect provides generic tools to support any requirements method and any type of requirement can be created and managed using built-in types or by using stereotyped elements and Tagged Values.